ELLIJAY, Ga. – Gilmer is once again in issue with rezonings when considering items this month. Considerations of wineries, tasting rooms, wedding venues, and lot sizes came to discussion in February’s Commissioner meeting. The major contentions came when considering a conditional use permit for a “large” wedding venue. The item for A-1 Agricultural with Conditional use for 582 Cinnamon Lane created debate between Public Works Director Jim Smith, Planning and Zoning Director Karen Smith, and County Attorney David Clark as the board sought guidance and information about the issue. The venue actually came as two items, the board unanimously approve the winery and tasting room in one vote, then discussed the conditional use for the large wedding venue at the same location. Jim Smith warned the board to consider the county roads when allowing the possibility of more vehicles and traffic of a large venue. Ultimately, it was Attorney David Clark who noted that the current item was a wedding and events venue as opposed to Large Recreational Venues which expected larger crowds. Gilmer County Commission Chairman Charlie Paris noted concerns and calls he had gotten on the issue. He later said in the meeting that he wouldn’t support the larger numbers of over 200 people at the event. However, he indicated he didn’t want to restrict them to less than 100 either. Smith later raised concerns about the public accessing the venue through Cinnamon Lane, preferring they instead use Old Flat Branch road. Final approval for the wedding and events venue came with conditions including no more than 200 people, ingress and egress be through Old Flat Branch road, and that expenditures related to it, such a deceleration lanes, be the responsibility of the facility owners at the location. All three board members voted to approve the conditional use permit. ELLIJAY, Ga. – The Gilmer County Board of Commissioners split their opinions on an idea to alter the Chamber and County sharing of the Hotel/Motel tax during budget sessions this year. Brought up during the Chamber’s meeting with the board by Post 2 Commissioner Travis Crouch, the two entities delved into what it would mean to possibly shift the current 70/30 split to increase funding for the county as well as a boost in their own ambitions for increasing tourism and county draw. Crouch mentioned only shifting it by 10% to a 60/40 split in the Chamber’s favor. Among several ideas, the county’s recent agreement and push for better signage at the county line arose. The idea resurfaced after a recent push from citizens to claim Gilmer as the Wrestling Capital of Georgia. The county is actively seeking funding sources for the project. However, the idea of funding it through the capital budget seems less likely as the budget meetings revealed at least two departments whose request could consume the entire budget on their own. Ultimately, Crouch noted that he has enjoyed and appreciated the Chamber’s work. Instead, he noted that as a business owner he agrees, but as a Commissioner, he sees the constant people talking about road conditions and similar needs. He went on to say that the change wasn’t by any means a reflection of a poor job by the Chamber, but rather he felt at a certain point, he was seeing diminishing returns alongside greater needs elsewhere. Paris noted that the last four years have seen increases from a 16 person crew to 22 people. He noted the equipment replacements including dump trucks, bulldozer, paving roller, road sweeper, and an equipment shed to prolong the life of that equipment. He made a point to note the progress the road department has made saying that the Road Department is continuing along the path of improvement. He said they will continue needing to reverse the department’s neglect for years to come, it can’t be solved in a single year. 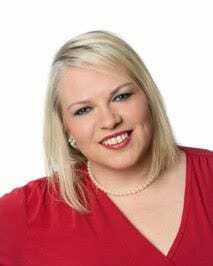 Chamber President and CEO Paige Green noted that she expects a plateau at some point. While she agreed with the ideas like gateway signage and organic growth from the county’s location. She added that she understood the “tough decisions” that the board makes, but the hotel/motel money reinvested in an appropriate way would be the long-term solution as opposed to the short-term solution of decreasing funding. Post 1 Commissioner Dallas Miller also commented saying he would look at the number if the budget absolutely demanded it. However, as of now, no changes have been made in the proposed budgets split. The Commissioners still have their October 16 work session and October 17 regular session as well as expected special called meetings before the budget is balanced. 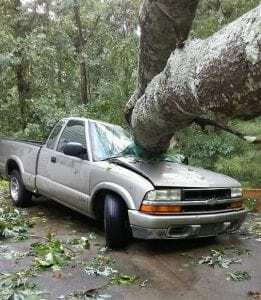 ELLIJAY, Ga – Not even two months have passed since Gilmer suffered through one of the worst storms it has seen in decades near the end of July, yet Hurricane Florence threatens to be just as bad, if not worse, according to reports from the National Weather Service and State Governments along the East Coast. Both South and North Carolina have seen mandatory evacuation orders for residents in certain areas. With the residents continuing to travel west away from the storm, Georgia’s State Government has spoken about accepting those fleeing the path of the hurricane. The National Guard and the Coast Guard have already been mobilized for support as well as forces from Maryland and even New York preparing to help. With a recent change in direction, the National Weather Service now indicates that North Georgia could see much more impact now. Public Safety Director Tony Pritchett said we are on the “dirtier” side of the storm today in a scheduled Commissioner’s meeting where he warned of potential dangers and damage that Gilmer could see from the southern turn of Hurricane Florence. The expected impact is so large that Georgia Governor Nathan Deal declared a state of emergency for the state. Based on the latest 11 a.m. forecast for Hurricane Florence and acting on a recommendation from Georgia Emergency Management Agency/Homeland Security officials, today I issued an emergency declaration for all 159 counties in Georgia. Officials are asking citizens to prepare for the oncoming storm and for an influx of people attempting to flee the storm, even as we are still recovering from the July storm. Public Works Director Jim Smith told the Commissioners today that his people were also prepared to mobilize in recovery and recuperation efforts. Commission Chairman Charlie Paris stated that the county is preparing its resources including Pritchett preparing the Emergency Management Program as the county readies itself to open shelters if needed. He also confirmed that while Gilmer is not currently in talks with the State about housing evacuees, it is prepared for the call with those shelters made ready. Preparing for the worst-case scenario, Pritchett said the Department already has response plans throughout the county, but cautioned citizens against “sounding the alarm” for something that may not be as bad as they are preparing for. Despite the declaration of a State of Emergency, he noted that at this time, preparedness is the best course of action as they have previously stated. These are the reasons that he encourages citizens to have cell phones charged and to prepare other means of charging in case of a need. Having these devices available to contact emergency response is also a part of survival. As you continue watching for news and updates regarding Hurricane Florence, it may be wise to go ahead and program the non-emergency response numbers into your phone in case a need arises. If you have questions, concerns, or a need contact Headquarters at 706-635-1333 or the non-emergency dispatch number 706-635-8911. Pritchett also encouraged citizens to keep an eye on the Gilmer County Public Safety Facebook Page for updates on the storm, shelters, and impact on Gilmer County. 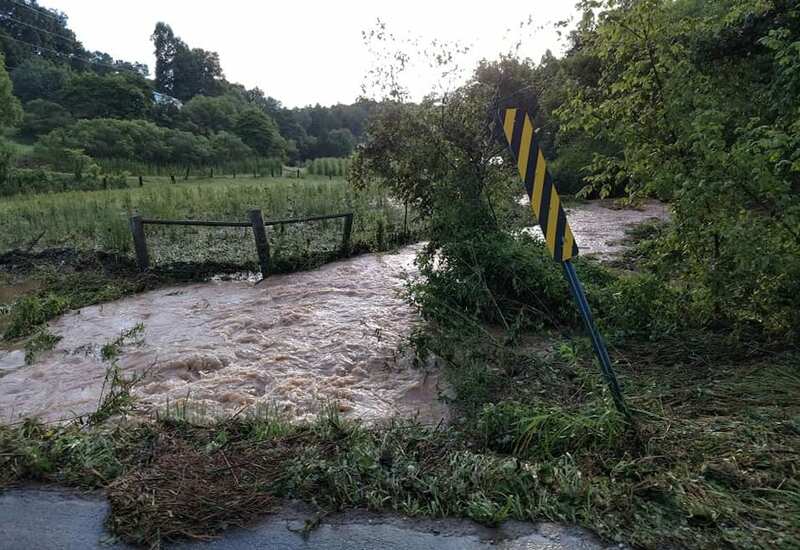 ELLIJAY, Ga. – As Gilmer continues to clean up and recover from Saturday mornings storm, officials are beginning to assess damage and costs for the county. According to Public Safety Director Tony Pritchett, around 4 a.m. on Saturday morning emergency services began receiving calls for aid around the county. As one of the hardest hit counties in North Georgia, the damage with downed trees and powerlines alone could have weeklong effects according to reports as power outages continue and line-men continue working around the clock to repair both downed line and downed poles. There have also been reports of mudslides causing damage to areas, but no roads have been blocked or destroyed. Pritchett reports that the emergency services only had one reported injury as a tree fell on a local woman’s camper in the Coosawattee area. As paramedics reached the woman, she was taken to an area hospital. However, no reports of any fatalities have come in as authorities are still, days later, responding to calls for aid. 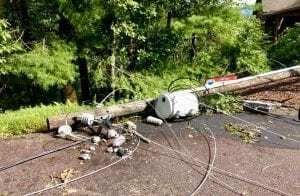 As the intensity of the storm increase through the early hours, an estimated 8,000 – 10,000 homes lost power in the county between Amicalola Electric Company and Georgia Power. Public Safety has counted 20 homes with trees on top of them as they continue the survey process. These were just a few of the different situations that Pritchett says they have continued responding to in the days since the storm. County services are in full swing with the Gilmer County Road Department and Public Safety department both attempting to clear trees from the roads as they find them. Gilmer County Commission Chairman Charlie Paris told FYN that the county is still collecting estimates for exact amounts of costs of the damage. However, their biggest disaster came in the Buckhorn area and the county golf course which lost part of its most recent paving of the cart path, has numerous trees down on the greens, and is still looking at water damage to the course. Early predictions say the course will not re-open to the public until Wednesday or Thursday at the earliest. Despite the highest damage to county facilities and equipment being there, the hardest hit part of Gilmer County is actually inside Coosawattee, according to Pritchett. 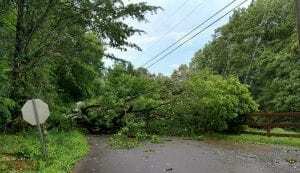 While the county continues the clean up in the outer areas of the county and the cities deal with the damage inside their limits, Coosawattee’s Public Works department is dealing with the mass of downed trees and road damage inside the resorts gated community. Gilmer has also experienced flooding in low-level areas. However, River Park, which has become notorious for flooding and flood damage in recent years, made it through the storm, according to Paris, with minimal damage and little to no flooding through the buildings. The major damage from the rainfall came with 5 damaged culvert pipes. Director of Public Works, Jim Smith told FYN that four of those pipes had part of their base wash away as water overtook the pipe and began flowing over the road. The fifth pipe, however, was located on Tyler Road, just off of Highway 282, and was completely washed out and carried away. This pipe had to be replaced and reset. However, the Road Department has all five locations repaired and passable for vehicles at this time. 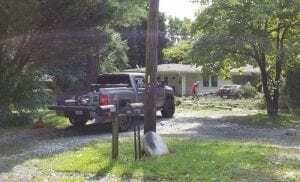 Alongside the continuing official response of the county, citizens are also still out in droves continuing to help neighbors chainsaw trees in driveways and across roads that authorities haven’t reached yet. Citizens across the county are calling it a major storm, the likes of which they have not seen before. Citizens are also reporting damage tolls in the hundreds of thousands between damage to homes and vehicles being damaged or crushed by falling branches, trees, hail, power poles, and other debris. Reports of damage continue through local farms including at least one chicken house struck by lightning and burnt down. Officials agree as the Public Safety Department is currently sharing all their information collected with the National Weather Service in attempts to classify the storm. Pritchett confirmed that they are collecting damage reports and assessing weather data to assess the possibility of microbursts, straight-line winds, or actual tornadic activity. Gilmer is not alone in its time of recovery, though. As is common practice with power companies, Gilmer is receiving aid from counties all over Georgia. Crews are in town this week from Volt Power, Amicalola Electic, Pike Electric, Sumter Electric, and Georgia Power among others. Two visiting workers confirmed they were from Columbus, Ga. and Atlanta, Ga. With others coming in from across the state, work is continuing for those parts of Gilmer and North Georgia that are still without power. ELLIJAY, Ga. – The Gilmer County Board of Commissioners addressed community development this month with a possible final solution to roadside trash pick-up as well as applying for a Community Development Block Grant (CDBG). Trash pick-up has been a developing issue over the last two months now as the board originally planned on hiring five seasonal employees for trash pick-up to work through the summer preceding the county’s mowing teams. However, a special called meeting in February saw new ideas as the commissioners began considering a new deputy in the Sheriff’s Department, similar in costs, to put inmates on the roads picking up trash. During that meeting, Gilmer County Commission Chairman Charlie Paris stated this crew would consist of four or five non-risk inmates under the supervision of one deputy. He described this option as a better long-term solution and one that is typically more favorably viewed in the public perception. At their regular March meeting, the idea was restated for the public saying the Sheriff’s Department would not need a new vehicle for the added deputy. The county will receive reports of the progress of the program to monitor and are still expected to have the teams move ahead of mowers in the summer months. This item was officially approved this month, so citizens should be seeing these teams on county roads, not state-owned roads, in the coming months. They will also be skipping over roads already cleaned and maintained by the Keep Gilmer Beautiful organization. March also saw the commissioners approve a CDBG for the area of Sunlight Road and Roundtop Road. Proposed by the Ellijay-Gilmer Water Sewage Authority, the approval by the board is the first step in the grant application process, meaning this is still early stages of a competitive grant process that the county will be entering into application for. If accepted, it would allow expansion of the water/sewer system closer to the southwest corner of Gilmer County, closer to the county line, according to Ellijay-Gilmer Water Sewage Authority Director Gary McVey. He estimated 200 residents of the area could be affected by the expansion. With the application due April 1, late fall could see the beginning of construction if approved with an expected one-year construction time. In addition to these items, the Board of Commissioners approved applications for 2018 River Outfitter’s licenses for Cartecay River Experience and Coosawattee River Resort and an Alcoholic Beverage license for Mohammad Nizar Tharani at Ellijay Mini Mart. 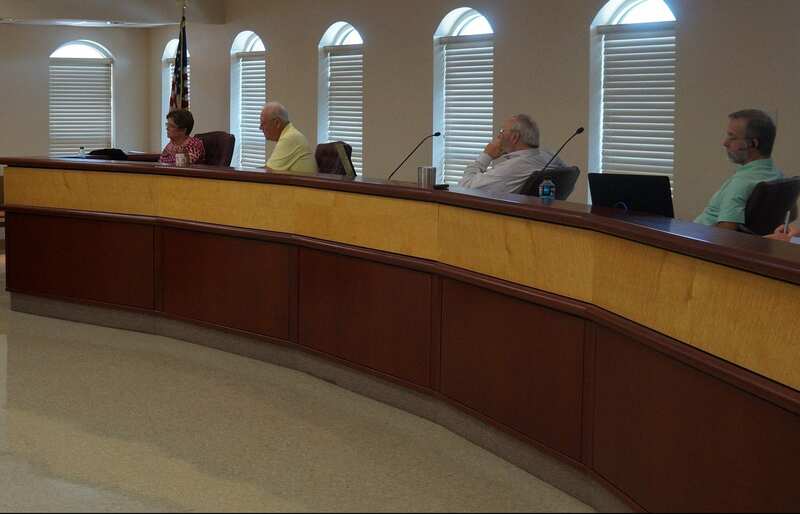 ELLIJAY, Ga. – The Gilmer County Board of Commissioners discussed a rising issue of trash in their February meeting after County Commission Chairman Charlie Paris said he had been getting a large increase in calls about the issue in recent time. While the commissioners discussed possible county solutions, they noted that Keep Gilmer Beautiful works hard on the projects and attempts to help the county. However, Paris stated that the board needed a county response to the problem. The main solution discussed by the board includes adding four seasonal employees for trash pickup to walk the roads before mowing crews in attempt to clean the trash before it hits the blades of mower. The litter would be picked up and deposited in bags on the side of the road before a vehicle follows after to collect all of the bags. Going ahead of the mowers, in effect, sets a schedule and path for those employees to follow with a need to stay ahead of mowing crews. Additionally, having the seasonal status aids the county in terms of no benefits package or similar requirements. Keep Gilmer Beautiful already collects litter on 44 adopted sections of road in the county where they collect litter four times a year. Public Works Director Jim Smith stated these employees would not have to do those roads where Keep Gilmer Beautiful has collected recently. Paris asserted this service was to help the situation above and in addition to what their organization accomplishes. While the additional employees were discussed, and approved, as a first step, all three commissioners agreed this would not be enough and want to continue looking at opportunities to change the “culture” in the county to make it so that both those who live here as well as visiting tourists avoid throwing trash on the roads. These four additional employees are set to be a trial basis this year and was roughly estimated during the meeting to cost the county $45,000. While discussion included possibilities of increased litter fines and additional education, continued research will be required to see what the commissioners are able and allowed to do. In their regular meeting, Gilmer County Post Commissioner Dallas Miller said, “It’s a behavioral, cultural attitude that our public seems to take these days that they didn’t use to.” Reiterating the need for more than just additional employees was only one part of the issue. Gilmer County Post Commissioner Travis Crouch held issue with already considering unbudgeted changes in February after going through the long budget process and having to cut departments severely so recently. His note tied into another issue related to the trash. In the past, a large portion of litter pickup was handled through community service, a trend that has changed, according to Paris, with changes in probation for crimes. While the commissioners are considering the budget change for litter, they are also considering a budget change for the Probation Office, located in Pickens, and Gilmer’s share of funding that. Responding to the calls of the citizens to deal with the trash on roads, Paris stated he wanted the people to know the board is responsive to their calls for support. ELLIJAY, GA – The Gilmer County Board of Commissioners held the budget review sessions in preparation for the 2018 Budget. The videos below document the departments with which the Commissioners spoke. Citizens can attend the Budget Finalization Meeting on Monday, Nov. 6, at 10 a.m. or stay with Fetch Your News for updates after the meeting. 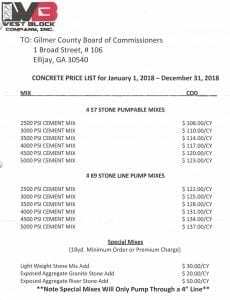 ELLIJAY, Ga. – The Gilmer County Board of Commissioners approved Materials Bids for the coming 2018 year. After accepting bids for the five areas, only one has been rejected. Emulsion was the one rejected bid. 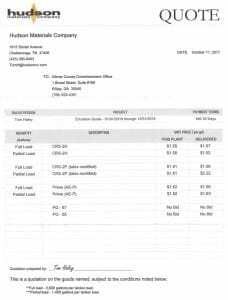 Hudson Materials delivered a bid to the county for emulsion over $1.50 for all three of their materials. Deemed higher than expected, the commissioners voted to reject this bid. Chairman Paris assured those present there would be enough time to rebid this before the new year. C.W. 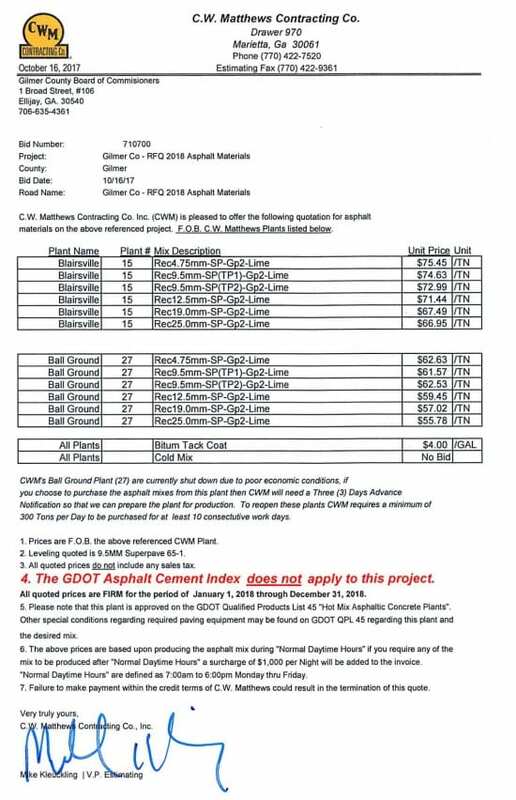 Matthews Contracting Company out of Marietta, Georgia, was awarded the county’s asphalt bid for materials ranging between $55 to $62 for 2018. 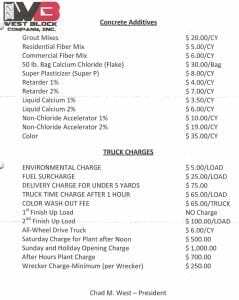 Increases in these prices are also affecting paving projects and the Local Maintenance and Improvement Grant (LMIG) for 2018 as Public Works Director Jim Smith estimated the county will be able to pave 7.63 miles with LMIG next year. West Block Company was awarded its bid for concrete, beating Wayne Davis Concrete Company. Though discussion arose on certain aspects of the bid such as a “truck time charge after one hour,” the commissioners ultimately awarded the bid after continued investigation still resulted with West Block being the lower bid. Another contested bid came with propane. 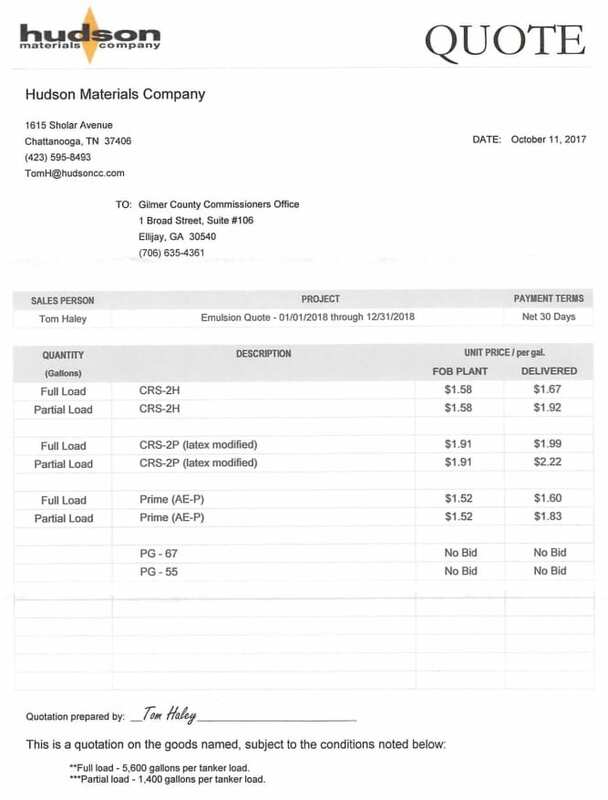 Though Heritage Propane delivered a fixed price bid of $1.49 per gallon, they were largely outbid by Appalachian Propane at $1.08 per gallon. 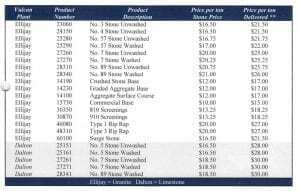 The final bid, stone, was another uncontested bid, same as it was last year, by Vulcan Materials Company. 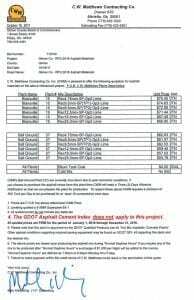 With prices ranging between $15 and $30 depending on the grade and type of stone, Director Smith also reports this is another bid continuing to increase costs for the county in the coming year.